Molds and mildews are microscopic fungi that live on water and organic matter. Although people use the terms mold and mildew interchangeably, they are not the same thing. Molds live on dead organic substances. Mildews are often classified as parasitic fungi that feed on living plant tissue and cause plant diseases. 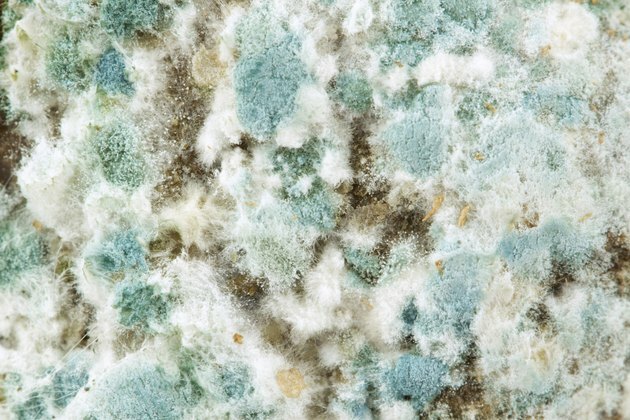 Of the many thousands of mold species, only about 200 species cause problems for people by ruining their possessions and causing allergic reactions. If you see or smell household mold, you have a mold problem. In nature, molds break down dead organic material and return nutrients to the environment. Molds reproduce by spores, which act like microscopic seeds that form new mold growth when they land on suitable locations. Molds are found indoors and outdoors wherever warm, humid conditions exist. Shady, damp outdoor areas with rotting vegetation will harbor molds. Indoors, molds will be found in basements, showers and any other warm place that has high humidity and organic materials. Molds reproduce by airborne spores. When a mold spore lands on a place that has the right conditions of temperature, moisture and nutrient availability, it sprouts. Molds grow best at temperatures above 75 degrees Fahrenheit with relative humidity above 65 percent. Some extreme species can survive temperatures down to 32 degrees Fahrenheit or up to 140 degrees Fahrenheit. Molds feed on cellulose-based materials such as wood or paper and on cloth such as cotton or linen made of organic cellulose fibers. Molds also feed on protein-based materials such as leather and hair. When suitable conditions exist, a mold spore grows threadlike filaments called hyphae that release enzymes which break down organic matter so that its nutrients can be absorbed. The nourished hyphae grow into a mycelium, the main body of the mold. Some of the hyphae become the mold's reproductive organs. If environmental conditions are right, they form new spores that are released into the air to start the life cycle over again. Environmental control is the best way to protect yourself and your possessions from mold contamination. Relative humidity is the critical factor, followed by temperature. Keeping the relative humidity between 45 percent and 65 percent, and the temperature below 70 degrees Fahrenheit should prevent mold growth. Ensuring adequate air circulation in the home also helps to defend against mold growth by encouraging evaporation. Does Styrofoam Installation Collect Mold?